Ruby sat at the laptop, clicking through the live feeds. She studied Holcomb for several minutes. She wouldn't see Eddie or Bryce of course, but they'd been there. It was a connection, and it made this whole world feel more real to see it there now. Not much happened outside Holcomb. A grazing cow moved passed the screen, briefly obscuring the impossible town. She'd done this for an hour. Once Kevin had shown her how to work the feeds, he stumbled off towards the bedroom, mumbling about how much the couch hated his back. Hera spent most of her time outside, but she'd stepped inside once or twice to stare mournfully up at Ruby. Ruby stopped at a feed showing a statue. It was a tall figure that towered over the pedestrians below it, clad in a billowing stone robe with a hood that obscured the face. The robed figure held a globe in one hand and a rat in the others. Ruby studied it, feeling a stirring of familiarity. She'd seen this before. But where? A woman passed by beneath, her hair done up similar to Hera's, dreadlocks pulled in a ponytail near the top of her head. She wore a similar, colorful cape. "The blue pedestal," Ruby muttered. "That's just like..."
She found Hera once again standing just inside the door, peering up at Ruby with puppy dog expectation. "Hera, come see this," Ruby said, waving the girl up. "Hera, you can't see this from there. Come look." She pointed at the huge screen. Reluctantly, Hera stepped into the room, her hands cradled together against her breastbone. The moment Hera spotted the big screen, she cried out and ran up the stairs. 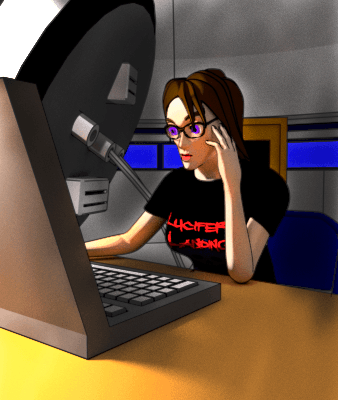 She babbled in her own language, pointing and waving to the left of the screen. She patted Ruby on the back and pointed again. "I don't understand what you're saying. You want me to... what? Move the screen?" Hera pointed insistently at the side, just off screen. Ruby frowned. This feed was coming from a live camera. Did the camera turn on its base? She clicked on the mouse and dragged to the left. The camera angle turned right. She moved it the other way and the point of view panned to the left. 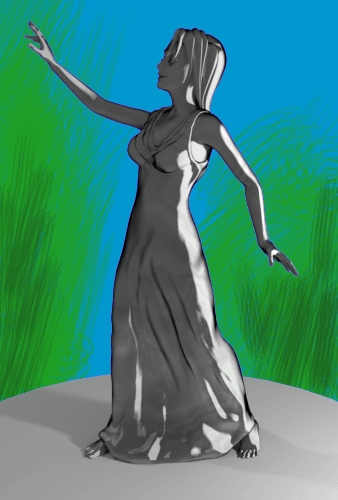 When another, smaller statue became visible, Hera leapt up to the screen, tapping the smaller statue. Ruby squinted. "Not sure what I'm looking at." She tried the up and down arrows. Nothing. She rolled the scroll wheel up. The image of the statue expanded until it filled the screen. Ruby stared at it, dumbstruck. The marble figure of a young woman wearing a beautiful, flowing gown. She lilted to the side, one hand poised behind her, the other reaching up as if beckoning to the sun, her expression a faint smile. Hera beamed. She pointed at the statue and said, "Ruby." Ruby lost track of time for the next fifteen minutes. She stared at the statue in the fading twilight as Hera spoke with increasing animation. The marble statue wasn't just a vague likeness. Somehow, it was Ruby. It was Ruby's face exactly. Hera tugged at Ruby's arm. Ruby ignored her.
" Kaj vaje te uro, Ruby," Hera repeated, pulling Ruby to her feet. "I don't know what you want me to do," Ruby said. She gave in to Hera's demands, allowing the girl to draw her away from the desk and down the stairs once more. "It's not like I can fly down to your city." Hera continued to jabber as she drew her down. Kevin walked out of his bedroom, rubbing his face and yawning. "What's all the noise?" he mumbled. "Sorry, it's Hera. She just... she really..."
Hera yanked Ruby forward, causing her to stumble. Hera led her back outside to the clifftop. It was evening now, and as the sunlight faded under the horizon, lights flickered in the city below. Hera pointed and spoke urgently. "I understand you want me to do something," Ruby said. "But I can't fly down there." Hera pointed at the city, then at Ruby. She pointed back at the city and said, "Ruby." "Yeah, you want me to go there. I get it." Movement caught her eye in the caldera below, the slow progress of creatures nearly too small for Ruby to discern. They soared over the city and the forest beyond. "Dragons," she said. Hera saw the same movement. She nodded and pointed. "Drakoon." Ruby repeated the word. "Drakoon." It wasn't too different from the English version. If Hera slowed down, could Ruby understand her. She considered this, tracking one almost microscopic speck of a dragon as it flew across the caldera, her eyes wandering towards a stark rocky ledge just a few feet below her. There, lodged in a crack in the rocks, lay a tiny form. Ruby stared for a few seconds before she realized what she was seeing. "Skylar?" The Fixie lay still, her wings frozen outstretched, her arms over her head as if she were a Superman action figure. Skylar didn't budge when Ruby called her name. Ruby looked for a way down. It wasn't too far to jump, but the ledge was narrow, and she feared losing her balance and falling over the edge. She got on her hands and knees, plotted a course along the rock and threw her leg over the side. Hera tugged her back, scolding her. Ruby pointed. "I'm not going to jump or anything. But my friend is down there." Hera peered down at Skylar, then back at Ruby. She pushed Ruby aside and jumped down to the lower ledge. Ruby watched, horrified. Hera landed on the rock and nearly toppled forward into the open air. She hung there for a second, teetering on the edge. Hera leaned back enough to right herself. As soon as she was safe from falling, she wrapped her arms around herself. Her locks tumbled turbulently and her cape whipped about her, hammered by a strong wind. Ruby barely heard the girl's groan of discomfort. It was as if there were a barrier between them that muted sounds from outside. Hera huddled against the rock face, shivering. It's cold down there, Ruby realized. And the air is thin. Hera was outside the protective anomaly that kept the area around the observatory habitable. "Hera, are you okay?" Hera didn't move. She stood rigid. Hera finally turned. She looked up at Ruby with glazed eyes. "Can you get back up here?" Ruby reached down. Hera stared up at Ruby's hands and shuddered, her eyes distant and filled with pain. She wasn't going to make it. As Ruby watched, Hera swayed uncertainly. Ruby could run back to the observatory and ask for a rope, but Hera might not be here when she came back. 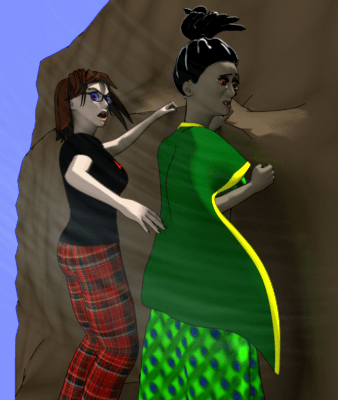 Ruby had managed to climb to the top of the pinnacle, but it was clear that Hera could not. Ruby grit her teeth and turned to lower herself over the cliff. Her legs chilled the second she dropped them over the edge. The rest of her followed, until she was hanging on the edge, seeking a foothold on the rock. Slowly, she scaled down into the maddening cold. She made it down, shivering, and stood beside Hera. She'd held her breath on the way down. Now as she took an icy breath, she realized her mistake. She wouldn't last long here. They had to go back up while she still had her wits. Ruby reached down and pulled the frozen form of Skylar from the rocks. She smoothed the fixie's wings down along her back and tucked her inside her shirt. Then she took Hera by the shoulder. Hera's skin was icy to Ruby's touch. Ruby wrapped her arms around the girl and held her for a moment, speaking in her ear. "We're going to get you up now," she said. Hera shivered against her. "You just need to turn around and climb." She guided Hera's movements, drawing one of her rigid arms away from her body and towards a handhold on the rock face. "We don't have to go far," she called over the wind. "I'll be right behind you." Understanding came slow to Hera. She pulled herself up to the rock, finding a foothold with slothful slowness. Ruby climbed beside her. Encouraging her up. At one point, just a foot from the top, Hera stopped. 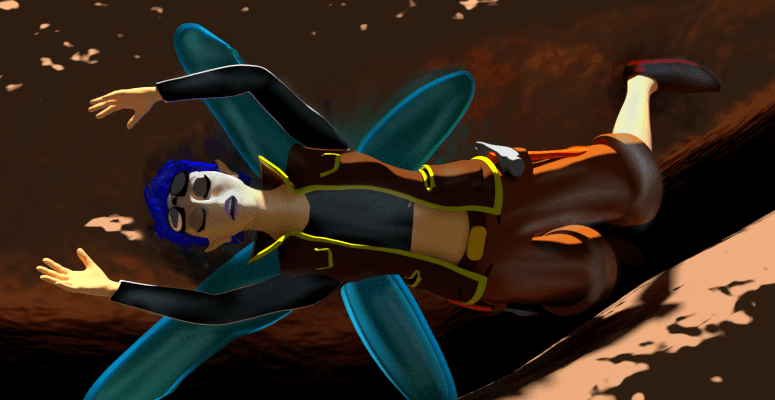 Ruby faced a moment of terror as Hera slumped back from the cliff. "Don't you pass out," Ruby shouted. "Wake up! You idiot, wake up and climb!" Hera startled as if she'd just caught herself falling asleep. She nodded and continued upward. When her face reached the top of the ledge, she took a deep breath and gave a quick belly laugh. Her movements became quicker as she pulled herself onto the top. 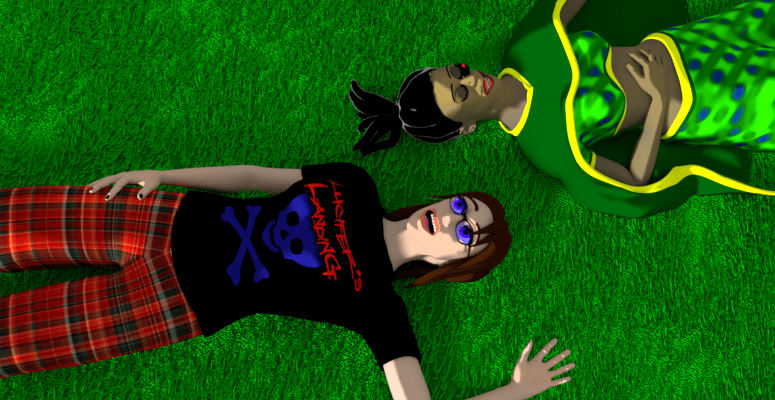 Both girls collapsed when they reached the cradling warmth of the grass. They rolled onto their backs and stared up at the starry sky.
" Wake uppa," Hera echoed in her sharp accent. " You Eeediot." Ruby snorted. Soon, they were both laughing out loud. They stumbled back into the observatory minutes later. Kevin turned towards them from where he worked on the telescope platform. A big fuzzy pale circle dominated the wall screen. Kevin grunted and returned to his laptop. Ruby drew Skylar out of her shirt. The fixie was still cold. Was she broken? "Skylar?" Ruby examined her. She found the switch on the fixie's shoe. She turned it off, then on again. Immediately, the fixie sprang out of her hands, darting around the room like a high-octane horsefly. Kevin watched from his desk on the platform. "Holy crap! You have a fixie?" Skylar zipped up and down the length of the telescope, then stopped at a circuit box on one end and popped the cover off. As Kevin cried out in alarm, a pinprick of light burned under the fixie's attention. She had her welding torch out. "What's it doing?" Kevin cried. "Get it off." "Is she... you think she can?" "She's fixing your telescope. Whatever's wrong, she'll make it right." The fixie zipped away from the circuitry, bounded towards a panel halfway up the telescope, pushed it up and disappeared inside. "It's inside the telescope," Kevin shouted. "Get it out. Get it—"
The fuzzy image of the pale sphere on the wall screen sharpened. The blue blotches became oceans, the brown blotches became continents. White churning wisps swirled over the surface. Ruby climbed the stairs to get a better look. "It's a picture of the Earth." Kevin didn't answer. He stood frozen, facing the screen. "So what's the big deal?" Ruby said, moving beside him. Kevin moved close, scrutinizing the details. "Half of California is gone—the Baja Peninsula and..."
"And I don't see cities. At this range..." He trailed off, biting his lip as he squinted at the high definition depiction of the world. "I don't get it, Kevin. What does this mean?" "Don't you?" Kevin turned to look down at her. "You don't see what this is?" "This is coming from the telescope." "Remember the extra planets I'd mentioned?" He pointed. "That's Earth."